Competition prep and training can be an incredibly nerve-wracking time for any pole dancer. Despite all the anxiety and physically taxing aspects leading up to a performance, creating a beautiful costume can be a welcome distraction. As someone who has found solace in spending hours gluing rhinestones on a costume for competition, I can say that it is the activity I look forward to the most throughout the whole process. Here are just a few tips to help you get started and provide inspiration. Tip 1 - If you are not an experienced seamstress, find the perfect base to your costume. The best place to start off is to find a pole outfit that fits you perfectly with minimal chance of a wardrobe malfunctions. If you have a preferred brand of pole wear where the sizing is consistent with what fits best for your body, you can choose a solid color to use as a blank canvas for your imagination. It’s amazing what you can do with a plain pair of shorts. Just be sure to use a seam ripper to remove any logos. Here’s an example of a plain black bra from PSO that you can embellish. Have you ever seen a costume during a performance that just dazzles with the dancer’s every movement? It’s likely because it is covered in rhinestones. Rhinestones come in a whole spectrum of sizes shapes and colors. The clear rhinestones reflect the most light and therefore will be the most radiant on stage. I have tried using black rhinestones and unfortunately, they weren’t as noticeable on stage as they were up close. This is common for a lot of the darker colors. If you order yours online, I recommend purchasing a smaller quantity first to test them out, because the shade of the color can be vastly different in person than in a photo. When it comes to securing the rhinestones to your costume base, a great product to use is E6000 glue. Regular fabric glue isn’t likely to work long term. 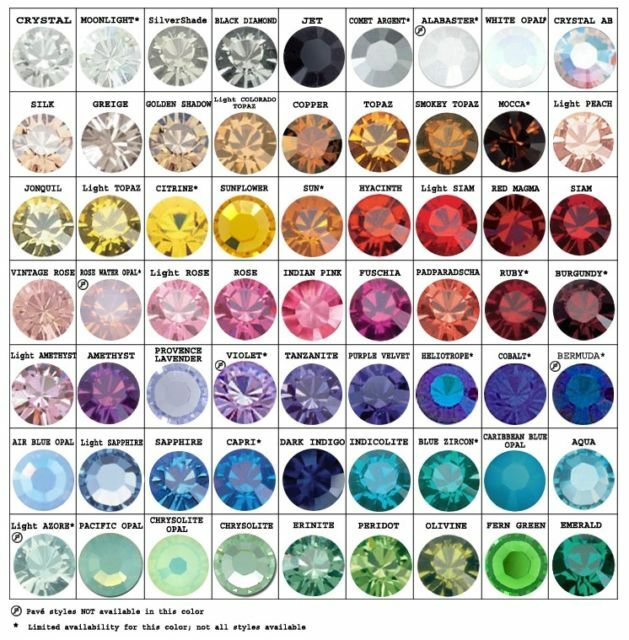 Here’s an example of some of the colored rhinestones that you can get. Using rhinestones can get pricey, so sequins are another way to add some shine. Just be aware that sequins can itch depending on where you put them on your costume. Want to add appliques instead of sparkle? Like rhinestones, these can also be pricey. One way to get details on your costume without dropping a ton of money on detailing is to find an inexpensive piece of lace and cut out the details you want. Try going to thrift stores and finding formal wear with a lot of embellishments if possible. Here are 2 crop tops that I made for my past routines. There is nothing more frustrating than doing a costume change during your routine and noticeably fumbling. Fasteners like zippers can get jammed, and buttons can sometimes give the appearance of fumbling while trying to remove an article of clothing. I once replaced a zipper on a skirt with Velcro for a costume and it made the change much more swiftly. I have even heard of other competitors using magnetic buttons to easily undo a shirt. Don’t forget to register any article of clothing that comes off your body as a prop to avoid a deduction! Costumes are not everything when it comes to creating the perfect routine, but they can really add to the mood of a performance. If you are a frequent competitor, you know better than anyone how pricey it can get with the cost of travel, registration fees and training. Making your own costume is a fun way to save a little money, and provide a release and creative outlet amid the stress and anticipation of performing.